Noel Kelly's Kids - A Tribute to Ben Fisher and Jack Thompson BEN FISHER JACK THOMPSON On Saturday 7th of May 2011 it was my pleasure to attend with my wife the tribute presented by the Pratten Park Magpies to Mr Ben Fisher and Mr Jack Thompson.Both of these men along with Bill Owens started the Pratten Park Magpies in 1986. A good time was had by all. Over 100 people attended the function which was held at the Wests Sports Club. 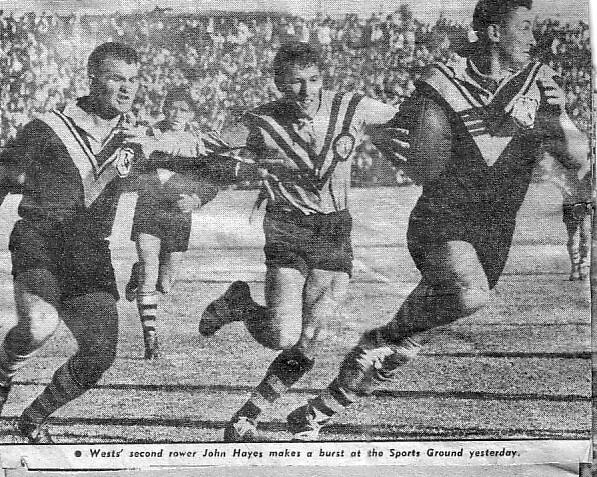 Master of Ceremonies Captain of Pratten Park Magpies Bruce Sacre A warm welcome from John Hayes. (Chow using no notes for his speech) Those were the days Chow. Mike Bailey giving one of his famous tributes John Wiles about to present Ben and Jack with a Wests gift. The Three Amigos Ben talking about how he Jack and Bill started the Pratten Park Magpies in 1986 Jack backing up Ben's story. Jack backing up Harry "Dealer" Wells a few years early. 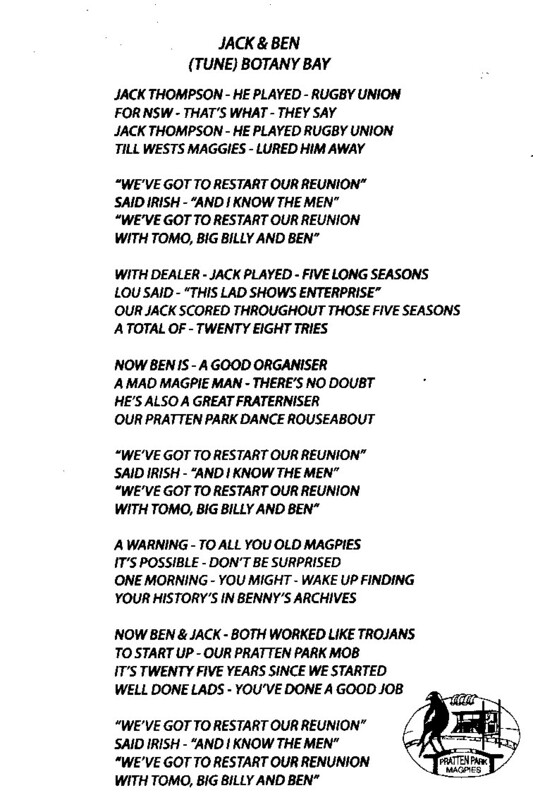 Ben with his daughter Felicity and Jack with his partner Evonne Bill Owens once again produced a fantasic DVD tribute of Ben and Jack as well as writing this song which was sung by Bill Cate and his son Mathew Cate. Bill Cate is the Bill of Bill and Boyd Bill seems happy with his DVD tribute. ( Bruce is telling Bill what a good job he has done on the tribute) Ben and his two grandsons Dan and Josh talking to Alan Davidson. Lottie Hopper and her daughter Karen George Downie and Harry Wells. 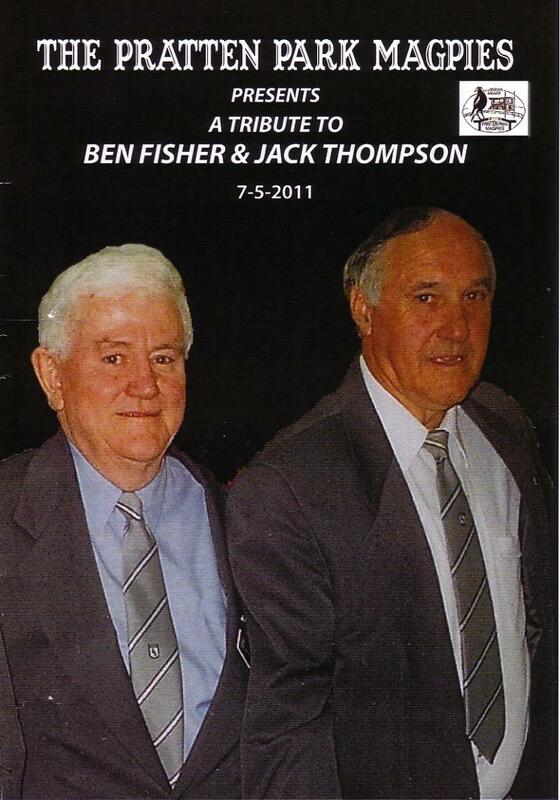 On Saturday 7th of May 2011 it was my pleasure to attend with my wife the tribute presented by the Pratten Park Magpies to Mr Ben Fisher and Mr Jack Thompson. Both of these men along with Bill Owens started the Pratten Park Magpies in 1986. Over 100 people attended the function which was held at the Wests Sports Club. A warm welcome from John Hayes. Those were the days Chow. John Wiles about to present Ben and Jack with a Wests gift. Jack backing up Ben's story. Jack backing up Harry "Dealer" Wells a few years early. Bill seems happy with his DVD tribute. Ben and his two grandsons Dan and Josh talking to Alan Davidson. 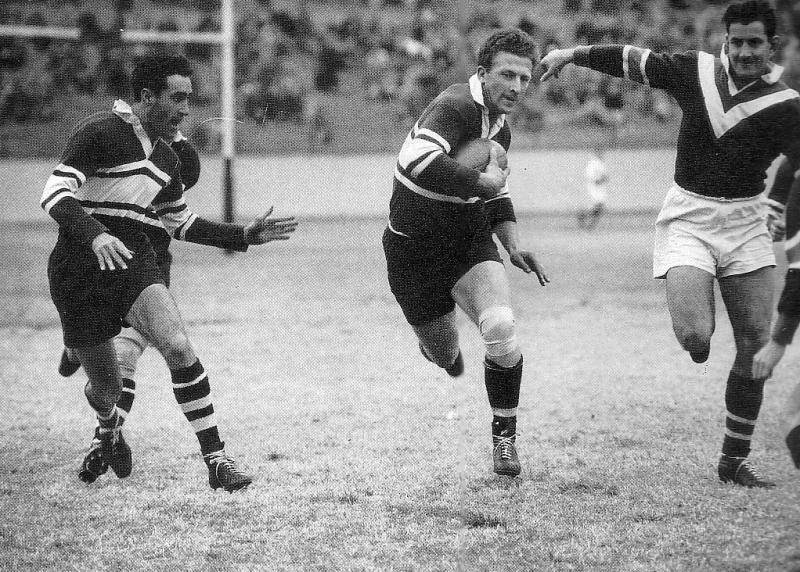 George Downie and Harry Wells.